The world is made for pairs. Pairs in every sphere....be it the two poles of earth, two poles of magnet, man and woman, cup and saucer, nut and bolt and the list is endless. But which is your favourite pair? For me, its of course music and dance! As it is truly said, music blows our mind and dance conquers our soul, there is no sorrow in this world that can't be forgotten with dance and music! Its the best way to freshen up our lives! When you are low after a heartbreak or bad scores in your exam; a monotonous week at the office or never ending household chores, the best way to unwind is to sweat at the pub! Music is incomplete with beats and beats have to be accompanied with steps! There may be a number of ways to freshen ourselves but for a major chunk including me nothing is more freshening than grooving to swanky beats! For that purpose I especially love going to concerts! So according to you which is going to be your dream concert? Now let's get really imaginative here. My dream concert would feature none other than the dancing pro Telugu heartthrob Allu Arjun. Accompanying her would be our very own Desi rockstar Anushka Manchanda. That takes me back to my medical college days when we used to organize concerts during our fests. Every year there used to be one main celebrity artist and lots of lesser known artists. The year when I was the organiser, I had arranged a concert of Palash Sen. Being a medico himself, he is always game for performing in medical college fests. Today when I think of those years, I wish I could turn back time and invite my now favourites Anushka Manchanda and Allu Arjun. So how would have been my dream concert? 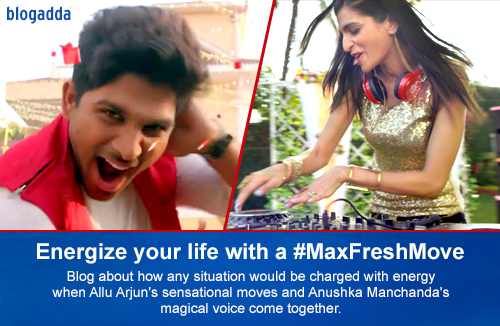 Anushka Manchanda would be performing with her full energy at the top of her voice. I have always associated her with never ending energy, a never say die attitude and oomph. She is our very own Posh Spice! She perfectly fits the definition of a rockstar! I am sure my college crowd would have gone crazy if she ever performed there. And to top up the burst of energy, I would have invited Allu Arjun to accompany her on stage. So how would the stage look like? Anushka herself grooves while singing. So there could be a possibility for both fighting for stage space :D I think we ought to get a very big stage because Allu Arjun's energetic and elaborate moves and Anushka's pumped up crooning would take up a lot of space! Oh I forgot the most important part of the concert...the audience! With two such superstars on stage, college crowd would have gone crazy. I am very sure that we would have required the entire ground for all the people to groove to the beats! Enough day dreaming for now. Coming back to reality, I wish that I actually get to see Anushka and Allu Arjun performing on stage...live!